Our group has been working for some time now – since 2006, in fact – on investigating the feasibility of providing South (and southern) Africa with emergency response pandemic influenza vaccines. The research was initiated after the Virology Africa 2005 conference that Anna-Lise Williamson and I organised in the Cape Town Waterfront in November of that year – when a senior WHO official warned us in his talk that “…if a pandemic hits, you are on your own: no-one will give you any vaccine”. A group of us sat down afterwards, and discussed the feasibility of looking at emergency response vaccine(s), given that we had no capability in the whole of Africa to make flu vaccines. 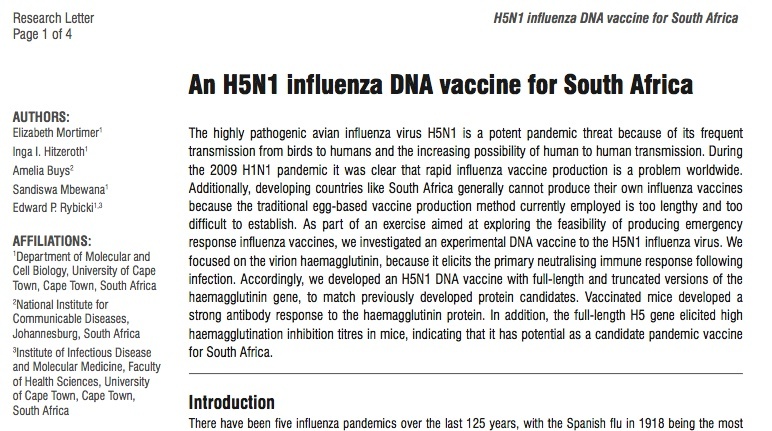 Anna-Lise and I put together a proposal, with the highly pathogenic avian H5N1 influenza A as a target, which was funded on a once-off one-year basis by the Poliomyelitis Research Foundation (PRF) here in SA for 2006 – and then again by the PRF as a three-year Major Impact Project (MIP) from 2008-2010, and subsequently to a lower level by both the PRF and the Medical Research Council of SA. 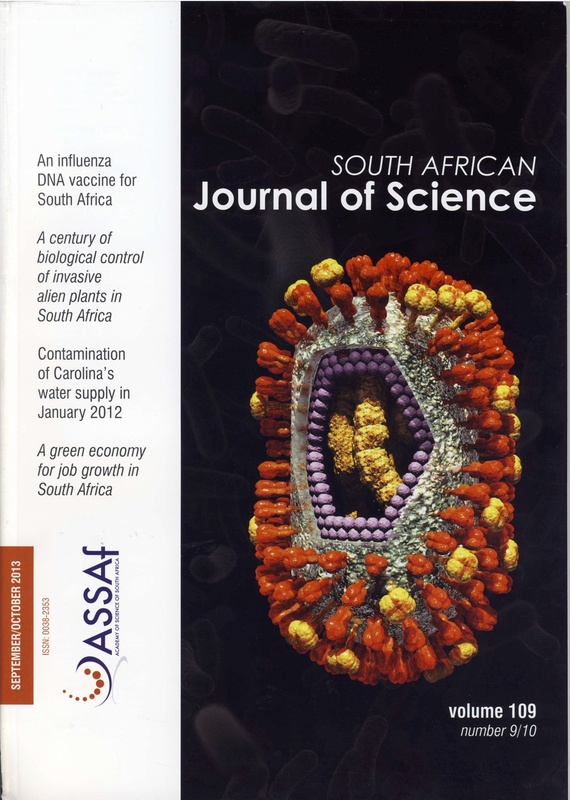 What made it all the more impressive for a South African project was that we had proposed expressing a protein-based vaccine in plants – quite a revolutionary prospect at the time, but something that followed on from the highly successful production of Human papillomavirus virus-like particles by transient expression in Nicotiana benthamiana by James Maclean, working as a postdoc in our lab at the time. However, some of the most important work was done early: James was very quick to get the haemagglutinin (HA) gene for the A/Vietnam/1194/2004 strain of H5N1 synthesised by GeneArt in Germany, and cloned into the same Agrobacterium tumefaciens plant expression vectors from Professor Rainer Fischer’s lab in Aachen, Germany, that had been used for HPV. His initial work showed that large amounts of HA protein could be produced, both as soluble protein which lacked a membrane localisation domain, and as the membrane-bound form. This work formed the basis for a patent application on the transient expression of H5 HA that has now been granted. 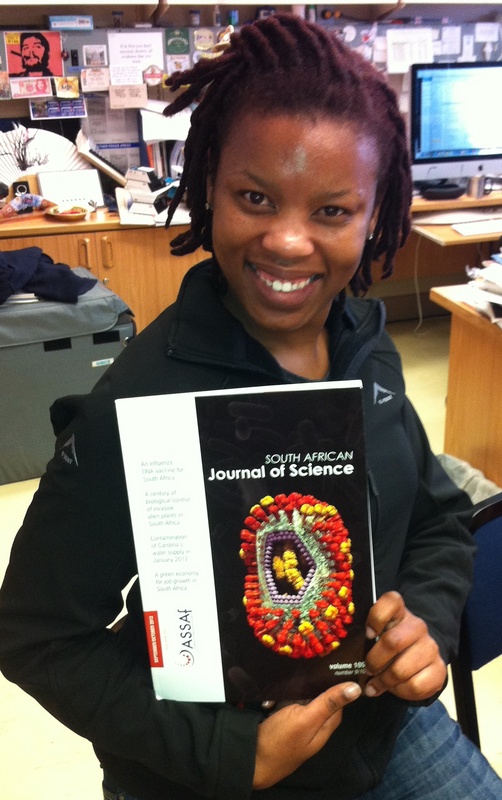 Subsequently, when the PRF MIP started, we employed Dr Elizabeth (Liezl) Mortimer and Ms Sandiswa Mbewana to further the work: with collaborators from the National Institute for Communicable Diseases (NICD) in Johannesburg and State Veterinary Services in Stellenbosch, this investigated transient and transgenic expression of soluble and membrane-bound forms and their immunogenicity, as well as a DNA vaccine consisting of the HA genes cloned into Tomas Hanke’s pTH vector. The protein expression work was published in 2012, as well as being featured here in ViroBlogy at the time. What we had managed to show was that we could get excellent production of the H5 HA in both soluble and bound forms, and that especially the membrane-associated form of the protein was highly immunogenic, and elicited antibodies in experimental animals that were appropriately neutralising, indicating its suitability as a vaccine candidate. Now this all happened despite our running out of money AND Liezl leaving to have a baby…and then we managed to get another paper out of the work, this time on the DNA vaccine side of things. 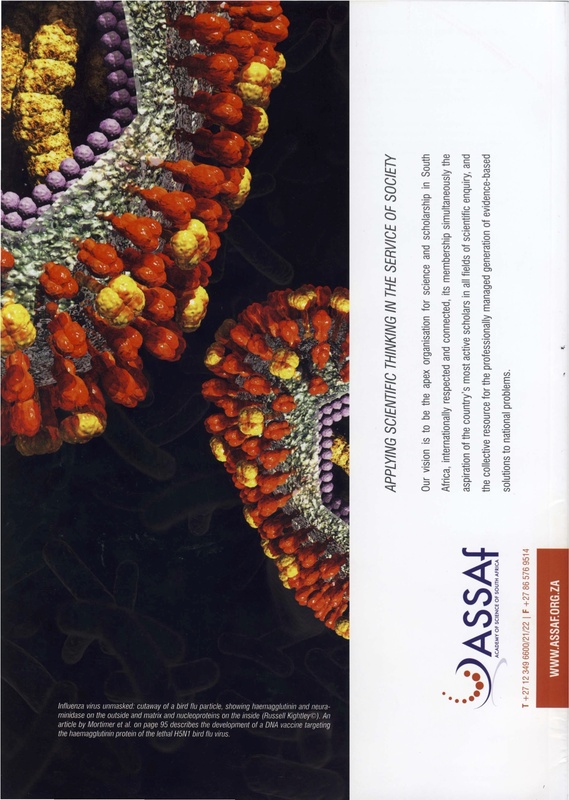 We pitched this at the South African Journal of Science as a vindication of the faith in us by exclusively South African funding agencies – and managed to get the cover of the issue in which it appears, thanks to the truly excellent artwork of Russell Kightley from Canberra, Australia. Front AND back covers, as it happens…! 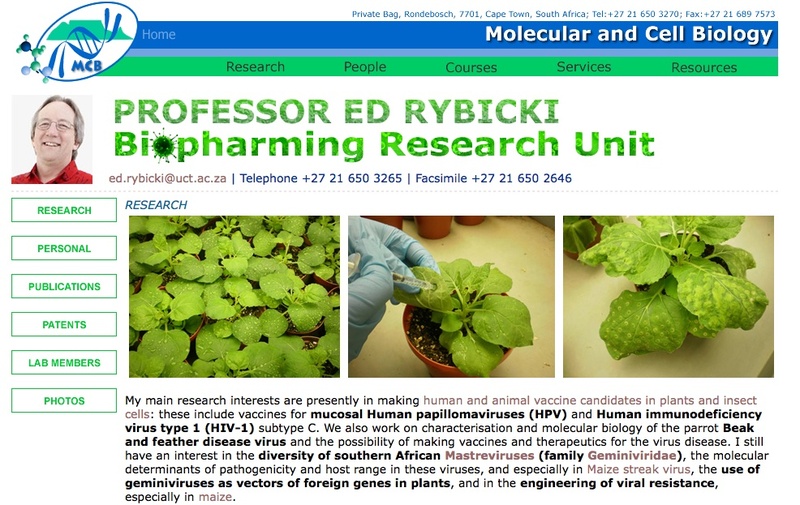 This all came in excellent time to mark the establishment in the Department of Molecular and Cell Biology at the University of Cape Town, of a new URC Research Unit: namely, the Biopharming Research Unit (BRU). There are some slightly disturbing connections between the H1N1 2009 pdm virus and narcolepsy: the virus itself seems to have caused narcolepsy in some of those infected; now a vaccine is implicated – is this an innate property of certain of the virus proteins, possibly? An international research team has manufactured a new protein that can combat deadly flu epidemics. The paper, featured on the cover of the current issue of Nature Biotechnology, demonstrates ways to use manufactured genes as antivirals, which disable key functions of the flu virus, said Tim Whitehead, assistant professor of chemical engineering and materials science at Michigan State University. And a possible reason for this could be that the H1N1pdm virus’ haemagglutinin is a natural “ancestral” sequence – the kind that HIV vaccine researchers are looking for for gp120/160, which have been shown to elicit a wider spectrum of cross-reacting antibodies than “evolved” proteins, or ones that have been selected for antigenic escape in humans for a good few viral generations. Engineered H5N1: the wheels grind on, and on, and on…. The Scientist has a nice collection of articles on this topic, which I have commented on all over the place, so I though I might consolidate some of it in one place. The point I and others have made before is that H5N1 and other influenza viruses are not waiting for us to let engineered versions loose, before they cause pandemics: all of the mutations noted by the Fouchier and Kawaoka groups are almost certainly present in the several environments where H5N1 viruses are now endemic – and all it takes for all of them to be present together is a little more mixing. Don’t discount other flu subtypes, either: while everyone is obsessing about H5N1, H3N2 is busy popping out of pigs in the USA; H9N2 in birds in Bangladesh; H5N2 in ostriches in South Africa – and all it would take is one or a couple of fortuitous reassortments, and a whole new flu virus could be unleashed. While the “deadly” H5N1s are being worked on in lockdown facilities. If we don’t know what the virus does, we won’t know what it can do. If we don’t know what to look for, we may be taken unawares, when the next 1918-type pandemic strikes. H5N1 Researcher to Defy Dutch Gov’t? There is the slightly older article – “Bird Flu Papers to Publish” – describing the reversal of the NSABB’s decision to ask for redaction of the two papers describing mammal-to-mammal aerosol-transmissible H5N1. So there you are: an actual recipe for aerosol-transmissible H5N1. It was always going to come out somehow, and now these two papers will probably the most cited flu papers ever. Nothing like a little hype! Meanwhile, H5 and its brothers and sisters are out there mutating away, with no help needed from anyone. Roll on universal flu vaccines! !